I recently had the pleasure of spending some quality time with the Salk Sound SongTower's, of which I really enjoyed. Much to my surprise, after some research and poking around I could not find a Salk Sound master thread. I know there are owners out there, so let this be the official Salk Sound owner's and discussion thread. Please post opinions, experiences and pictures. Let's all keep it civil and have some fun! 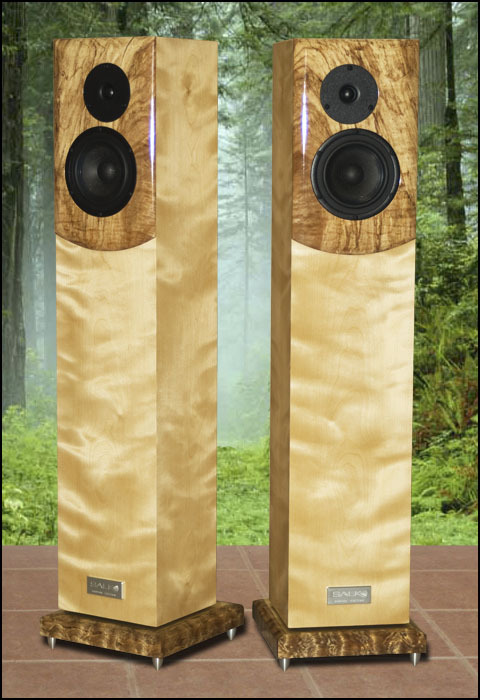 "We Hand-Craft World-class speaker systems, customized to your heart's content. Whether you're looking for an audiophile-class music system or an engaging cinematic experience, you've come to the right place. We'll help turn your dreams into reality!" I wanted to add that the SoundScape's, HT2 TL's and SongTower's are among the greatest loudspeakers I've ever had the pleasure to hear. I've never heard a midrange that detailed, lush and simply "right" on a speaker for these particular asking prices, not to mention such an enveloping 3-Dimensional and holographic soundstage. While listening I only hear music rather than a pair of speakers trying to reproduce the music; they just disappear. Without trying to sound like a reviewer from one of the "Big Three Magazine Publications," one would have to at least double the price before finding something competitive (my opinion, of course). With that said, Salk Sound more than deserves an owner's thread. Last edited by Nuance; 04-12-2017 at 08:16 AM. Thanks for starting this thread! I own a pair of SongTowers (same finish as in the pic you posted). I've owned them for about 3 months now, and IMO they are the best sounding speaker I've ever owned. What really impresses me about them is their open and enveloping sound and wonderful midrange. Bass response is simply outstanding. I posted my initial impressions in the SongTower thread before, but when I auditioned them at Jim's I asked him if a sub was hooked up since the bass response was so amazing..and he told me no. I've gone through a lot of speakers in the last couple years trying to find the 'right' one, and most of them were highly regarded here, but I don't have to look any more. I bought one of Jim's first commercial pair of HT'1s. I now have a complete system with HT3's as l and r mains, HT1 for a center and modded HT-1's for surrounds in a 7.3 system. For subs, I have two JLF113's in a stereo configuration (I cross at 40 for the mains) and an SVS for the LFE. I have a Lexicon MC12 and that gives me the three sub option. In addition, I have a pair of ST's that I throw into the mix occasionally. If anything, I spend too much time in home theater/music listening room. These are mine for front left/right. I also have 4 Selah (Rick Craig) Tanzanites for surround duties and 2 SVS Ultra subs I run off a Crown K2 eq'ed with an ART 351. 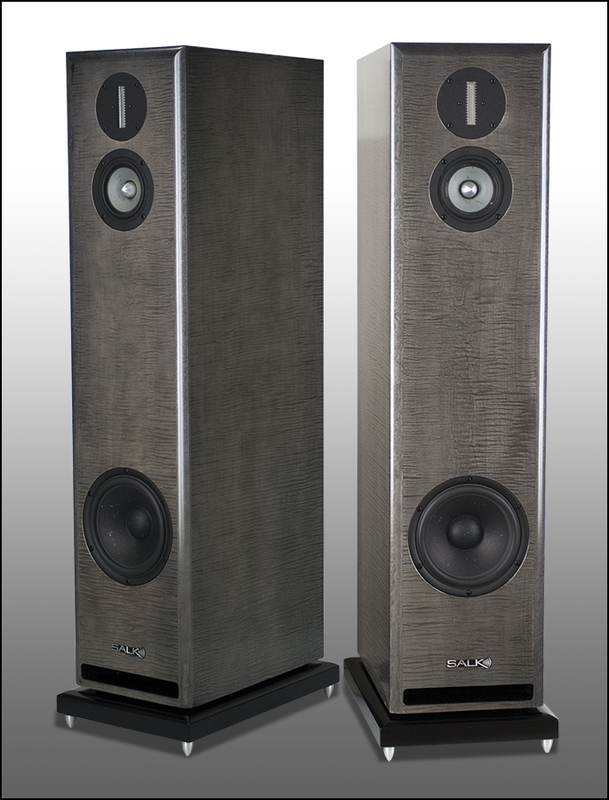 Jim Salk is GREAT to work with and the quality of these speakers, both visually and sonically, is stunning. Great to see a thread here! I always have to go over to audiocircle to post in the Salk thread there to find out info. 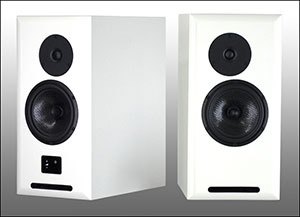 I almost bought a pair of the HT2's a few weeks ago, but I could not wait 90 days for the speakers. So that swayed my decision to the Dali Helicons. I hope to have a pair of HT3's in a dedicated 2 channel area one day. Again, thanks for starting this thread Nuance. I appreciated reading your reviews and comments of the various speakers in the Floorstander listening thread that you did with Craigsub. I found I agree with most all of what you said about the SongTowers. And you did that while also listening to a bunch of other speakers on the same day. I once tried that and found that it wasn't long before all the speakers began to sound the same. That was hard work. Similar to oldgoalie & Randybes, I own a pair of SongTowers (but not any of the other Salk products). I've had them about two months and I still can't wait to go home from work each day so I can listen to them more . My STs are finished in cherry veneer. I'll post a photobucket URL of photos once I've made enough posts here to become elligible. Jim Salk's wood finishing skills are simply the best I've ever seen. I'm happy to demonstrate them to anyone interested. I live in Maryland, PM me. Another good idea from Nuance...thanks for starting this thread, Brandon. As a hopeful-future owner of Salk loudspeakers, the pics and systems here have me needing a bib for the drooling. they're not just for breakfast anymore. A proud V3 owner in Makore. I have had them for about 6-7 months. I have had Allison speakers(they were fairly old) and still have PSB Stratus Goldi speakers in the theater. Give me ten men like Clouseau, and I could destroy the world. 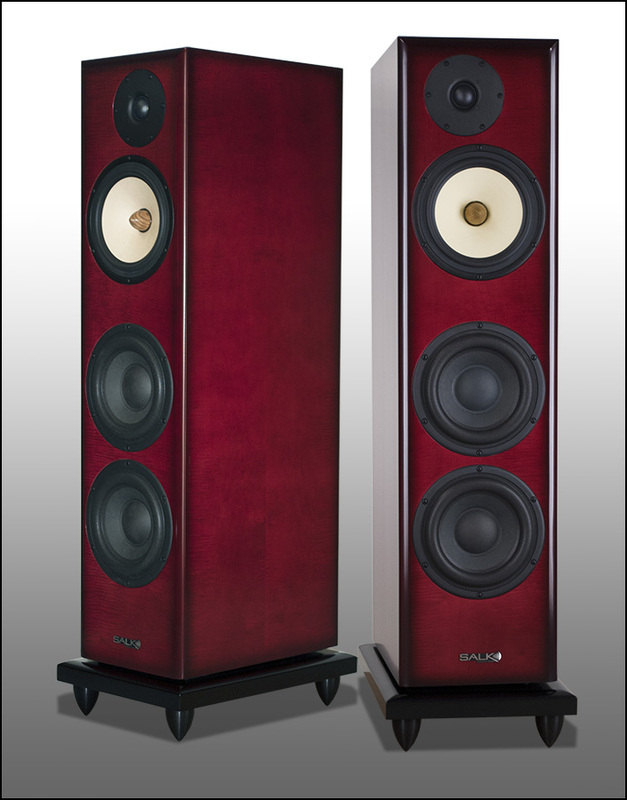 I have it for more than a year, since then I've been to 3 audio shows (twice RMAF, once CES), the only other pair of speakers that manage to light my fire is made by Acapella from Germany - but thank God, they cost over $50k..
After seeing them right in front of my eyes at RMAF07, I just have to get one..
Nuance...thanks for starting this thread. If there are any Salk owners in the Los Angeles area willing to have people over for a listen, please let me know. There are three or four of us that are very curious. Like all things on the Internet, do your research, as forums have a good amount of misinformation. Wow...it's cool to see owner's and those curious to listen already posting in this thread. Awesome! I had frequently heard "Salk Sound" mentioned here and there, but always blew it off because I didn't think I would ever get an audition. Then when Craig pretended that they weren't going to arrive on time, it was the final nail in the coffin for me; I thought I'd never get a chance. Boy was I thrilled to find out speaker # 4 was the Salk Sound Song Tower!! As I mentioned in the floor standing thread, I remember thinking to myself (while listening blind) that this was an unfamiliar sound; one of which I didn't expect. I was so lost when speaker # 4 came on, but in a good way. I, of course, was immediately struck by how amazingly clear and articulate the midrange was. After 10 minutes of listening or so I thought Craig had thrown a more expensive speaker in the mix to keep us honest (a speaker costing significantly more than the alloted $1500/pair budget). After 20 minutes my focus shifted and I decided it just must have had a "hot" or "forward" midrange. In the end, the speaker that I knew nothing about ended up squeaking by with the highest score (given by me). I had never heard a TL designed speaker before, but I sure did enjoy it. It confused my ears and played tricks one me. After being delightfully impressed by the Song Tower I did some research; research that eventually brought me back to my favorite A/V forum (here, of course ). I was shocked to discover that there was no dedicated Salk Sound thread and only a few threads about the former. Now, I'm only one guy and my opinions certainly aren't law, but I liked Jim Salk's product enough to start an owner's thread. Salk Sound doesn't get much play on these forums, and frankly, they should IMO. If their entry level product sounded this good, I'd love to hear some other offerings. Salk Sound deserves recognition IMO, so let's keep this thread going! I'm glad to see owner's and researchers posting. This is a great place to offer up reviews, picture and request auditions. Thanks again, Nuance. I just wanted to add a couple of thoughts on the issue of midrange reproduction, because this comes up again and again in different contexts, and I'm not sure it's understood very well. There are generally two reasons why the midrange might sound too forward. The first is inadequate baffle step compensation. This is a technical subject involving when a speaker transitions from 4-pi to 2-pi radiation, and I won't bore anyone with the details. But the bottom line is that if the crossover doesn't use enough baffle step compensation, there will be a peak in the response around 1 kHz, followed by a dip. The overall effect is emphasize voices and brass, but in a way that actually smears the sound. You will lose clarity and detail, not emphasize it. The second cause is a natural bump in the woofer in the same region, sometimes caused by a resonance where the cone meets the surround. Most woofers have at least a little of this, but some have quite a bit, including those used in a number of designs people have sent me for a make-over. Again, the result is not really accentuated detail, but an irritating edge on the sound. The Seas CA15 used in the Song Tower doesn't suffer from this problem. It's just nothing I had to deal with. Speakers that you might think are adding detail over and above what is in the recording generally suffer from a peak further up in the frequency range,in the 3-6 kHz range, and this emphasis is often combined with a dip in the crossover region (usually in the 2.5-3.0 kHz range) due to sub-optimal crossover slopes. That's the area I work hardest on, and I don't think there's a problem with the SongTowers--but I'm not trying to make this a commercial message. I could be wrong. In any event, I would like to point out that one of the theoretical advantages of a properly designed transmission line is suppression of the woofer's back wave, and therefore less blurring from refections back to the rear of the woofer. It's possible that you were picking up on that. But I haven't performed the necessary controlled A-B tests to make sure that the theory works in practice. Obviously, you can only judge the results if you hear the SongTowers, and I thank you for making it more likely that people will try and do that. Nice thread, Nuance and thanks for chiming in Dennis. I'm also curious to hear the SongTowers and was hoping for a generous and hospitable owner within an hour or two of the NE Ohio area. I'm not sure if Craig still has the said speakers at his place, but I was unable to join in the most recent GTG because of weekend classes. A very close friend of mine is still in the process of putting his budget together for a $3500-5000 6.0 setup (no room for two back surround speakers and he has a nice HSU sub), and we'd love to bring dinner and drinks and tunes to anybody willing to let us audition their Salks. Thanks in advance! Didn't you take the Rocket 850's home after Cragi's GTG? Appears to me that you slightly preferred the Song Towers. BTW, absolutely nothing negative intended by my question. You are a most excellent contibutor to the AVS forums. Just curious. I'm torn between (in no particular order) Revel Ultimas, Jim's HT-3's, Danny's LS-9's, or the collaboration between Jim and Phil Bamberg (when it becomes public). I would prefer a 5.1 or 7.1 setup which I am not sure how to accomplish with the LS-9's even though music is my top priority followed by HT. It was good to see this thread started as I am waiting for my HT3's, currently in the final stages of production. Thank you for that explanation, Dennis. While initially I thought the midrange was "forward," I truly appreciated it while listening during our test and felt that it was a poor way to describe what I was hearing. I apologize for using that term, because the midrange wasn't harsh or forward at all unless I really cranked the volume (naturally; this will happen with any speaker). I simply wasn't used to the TL sound and didn't know how to explain it. The only thing I can say about it is that the midrange clarity is the best I have heard in a speaker in this price category. Whether some may pass it off as forward or bright, I say it's just right and much enjoyed it. I heard every single detail and breath, which I could also do on some of the other speakers, but I didn't have to strain or really concentrate to do so. I think it's pretty safe to say that I loved the Song Tower and completely agree with you and Jim that adding bigger woofers to give more bass extension and midbass slam at the expense of losing that midrange quality would have been a bad idea. Most of us will be using a subwoofer with any speaker that doesn't hit the 20's anyway. Congrats on a fine product guys; it's too bad you "retired" from the business, Dennis. Yes sir, I did prefer the Song Tower's over the Rocket's, I won't lie. However, the Rocket's are also an exceptional product for the price, and as we all know Craig is the most generous of men, so I got a real good deal due to his generosity and thanks to my wife's surprise help. I immediately needed at least a pair of tower's and a center channel, all at a specified budget. Craig helped me out huge; something that would have been silly to say "no" to. I admit that I agreed to pick up the Rocket 850 Sig's and matching bigfoot center before I had even heard them (well, I had heard the center before). Well, much to my surprise and pleasure, the Rocket's are an awesome speaker, especially for their retail price. I was thrilled that these were the speakers I was taking home, but would also have been thrilled to take home the Song Towers (if those were the speakers I would have agreed to take, like I did the Rocket's). In my humble opinion, there isn't much better available in the $1500 price range besides the Rocket 850's, Salk Song Tower's and the Vandersteen 1C's. I'm just one guy and surely haven't heard everything out there in that price range, but I'm just telling it like it is from my perspective; no one has to agree with me...its just my opinion. Good products deserve recognition, and why Salk Sound didn't have it's own thread is beyond me. IMHO they needed a thread; they are that good in my eyes. And sure enough, there are owners on this forum. Very cool; that makes it worth it. P.S. I was about to start an owner's thread for the av123 products as well, but someone already beat me to the punch earlier this year. These two companies make exceptional products people; they deserve an owner's thread. I have HT3s and don't consider them to be bright. Not nearly as bright as, say, B&W speakers, which I cannot listen to for any length of time without stuffing the tweeter with foam or covering it up. "Congrats on a fine product guys; it's too bad you "retired" from the business, Dennis"
Hi. Actually, I was never in the business. This has always been strictly a hobby. Jim and I are still working on designs together. But if anyone would like to send me a check for $500,000, I probably could retire and spend full time on making Mozart come out of a box. Sounds good to me. Anyhow, I'm very happy you liked the Song Towers. 1. How close does the V3 get to the HT3 in terms of performance? 2. Are the Song Surrounds direct radiating bookshelves or something different? 3. Are the V3 Surrounds direct radiating bookshelves or something different? 4. Does Salk offer a smaller matching centre for the V3's other than the monster centre? I'm glad to see this thread started. I have HT3s with an HTC center and a pair of HT1s for rears. Love them. Jim is a great guy to work with. The main advantage of the HT3 is its deeper bass reach. I would say it goes about 4-5 Hz lower, and can handle more power. The midrange sound is a little different, since the V3 uses a smaller mid driver. Arguably the midrange is a little more prominent on the V3. The tweeters are comparable. They're direct--just very slightly revised versions of my CA0W1. I'm not sure what surround Jim has in mind for the V3. But it would be direct radiating. Maybe the HT1? Jim does have a design that can operate either as a di-pole or a bi-pole. It uses two W15 woofs and G2 tweets per side. So it's expensive. It was designed as a one-of-a-kind, but Jim will build you anything. 4. Does Salk offer a smaller matching centre for the V3's other than the monster centre? [/quote] You could use the HT Center, which is an MTM using the G2 and W18's. Or you could even use the Song Center. The voicing is pretty close. I have the monster center, and it's quite a conversation piece. But, if I do say so myself, it sounds really good. Hey! Don't leave out the HT-2s. These are mine, I have 3. If I was eloquent I could describe the "Salk Sound" in new and insightful ways. But alas, I'm just a simple country boy. Having heard a lot of speakers in the last 35 years in this hobby, these were the first speakers I owned that reveal damn near everything in recordings and soundtracks. From about 100Hz on up I've haven't heard anything I like better. Different yes but not better to my ears. Three of the things I listen for in a speaker. Imaging - soundstage height depth, width and placement. Midrange - does a piano, a violin, a guitar or a human voice sound like the real thing. Can you hear the reed in Paul Desmond's sax. Highs - do cymbals shimmer when massaged by brushes or radiate like water on a still pond when struck with a stick. Does the decay slowly fade into black. Do yourself a favor and listen to un-amplified music. Smaller string ensembles are nice like The Brandenburgs or Handel. 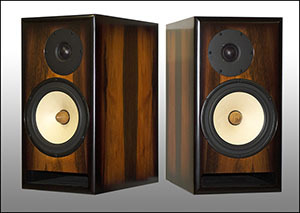 Put those in my living room and I really wouldn't care what they sounded like...sweet. Jims speakers are like a beautiful woman with curves in all the right places who opens her mouth and, MY GOD she's also a PhD! 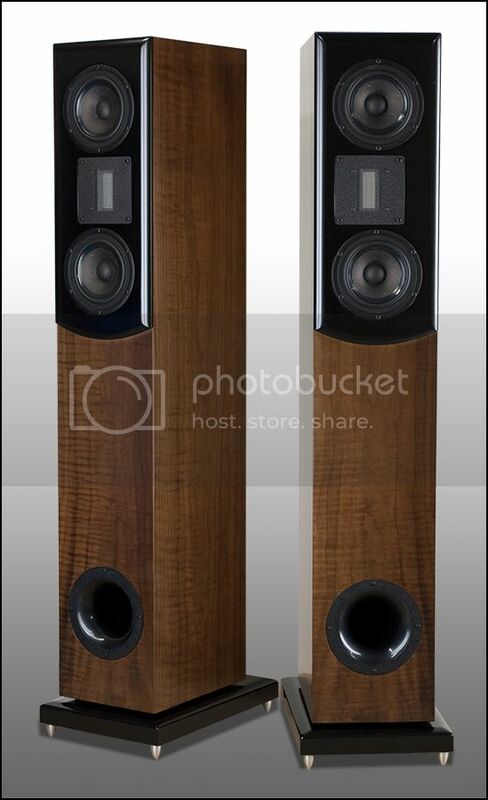 Some comments here: The V3's shown at the top from the site are my Rosewood pair and I have the monster center to match. These speakers replaced the Sig versions of the Rocket 850's and Bigfoot center. I was the first public owner/debuter of the Sig 850's. A well rounded speaker, but not in the same league as the Salks. The Salks have better drivers as the price reflects and more clarity, cleaner bass, better soundstage. The V3 is almost everything the HT3 is except the deepest bass due to the smaller woofer. It has the close relative of the G2 HT3 ribbon and it sounds fantastic. I also own HT3's. At a recent audio GTG I ran the V3's stereo direct w/o sub in the HT and everyone thought the sub was on. I have them crossed at 50 hz because they can do it. You can get an HTC for the center versus the monster center and it should be a fine match. I asked Jim to develop a monster unit and this unit is awesome. Dennis and Jim are quite the team. I am glad to see a Salk thread finally. Mr. Schifter convinced me ID was viable for quality audio equipment. It's about time other ID companies like Jim's get noticed. Obviously I am buying in pretty heavily now that 2 of my rooms contain Salk products. For those interested (there have been some questions), I finally got around to posting information on the SongCenter and SongSub today. The SongSurrounds are in process and we are starting to build cabinets. But since I do not have any pictures yet, I will leave that page for later. I don't know if it is kosher to post links or not, and I don't want to risk breaking AVS rules, so I will just say the pages are now on our web site. I checked out the Songsub on your website. You have the sub listed at $995 a pair . Are you sure thats right? It’s Almost May 2019 is Vizio Not gonna sell New TVs ? 65535 Attachment(s) Kansas City Area Home Theater Meets and Movie Night Events!